Built with exceptional quality this home exemplifies modern Mediterranean Revival Architecture. The imperial staircase leads to a striking front door with wrought iron details reflecting both strength and elegance. The spacious foyer welcomes guests into the open floor plan with surrounding views of Boca Ciega Bay. The well-appointed chefâs kitchen features cherry and maple cabinetry granite and a hand-painted ceiling with a brilliant crystal chandelier. Gorgeous wood and porcelain tile flooring sweep through the home into a grand living room featuring a marble fireplace. The master suite impresses with coffered ceilings and a master bath intended to provide a luxurious spa within the comfort of home. Spacious balconies overlook the infinity pool and spa. The deep-water dock comes with a 16000-pound boat lift and an additional slip to accommodate a variety of vessels. The home sits above a 12 car garage that will safely house a collection of vehicles boats paddleboards and kayaks. The home offers many additional luxury features and amenities including an elevator central vacuum water softeners and filtration an alarm system and more. 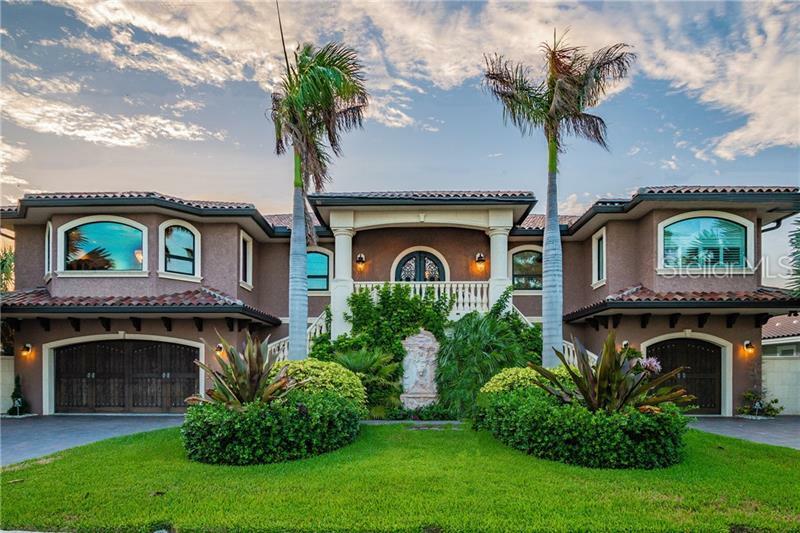 This property represents Florida living at its finest and is just a short walk to the sugary sands of St. Pete Beach.